Showtime has picked up half-hour comedy “SMILF” from creator Frankie Shaw, based on her short film of the same name. Rosie O’Donnell is set to co-star in the 10-episode series that will premiere this fall. “SMILF,” a co-production between ABC Signature Studios and Showtime, takes place in Boston and focuses on Bridgette (Shaw), a woman in her 20s coming to grips with being a single mom. O’Donnell marks her first series TV regular role as Bridgette’s mom, Tutu. Lee Eisenberg and Gene Stupnitsky (“The Office”) are executive producing with Michael London and Janice Williams. “SMILF” is adapted from Shaw’s short film, which premiered at the 2015 Sundance Film Festival where it was awarded the Short Film Jury Award for U.S. Fiction. Her 2016 short film “Proof of Concept” was a finalist in TheWrap’s 2015 Shortlist Film Festival. Showtime has been beefing up its comedy roster of late. The Jay Pharoah series “White Famous” was picked up in January, and the Jim Carrey dramedy “I’m Dying Up Here” launches next month. From Oprah to Ellen, daytime TV has found its own array of talk-show stars. But clearly the format isn't for everyone. Harry Connick Jr is about to launch a syndicated daytime talk show (premiering Sept. 12) produced by NBC. But the New Orleans crooner should be careful. A lot of stars have fizzled in daytime TV. Jane Pauley was the widely admired cohost of "Today." A natural fit for her own daytime show, right? Nope. "The Jane Pauley Show" premiered in 2004 and was canceled after just one season. Everyone loves Tony Danza, right? Maybe not. 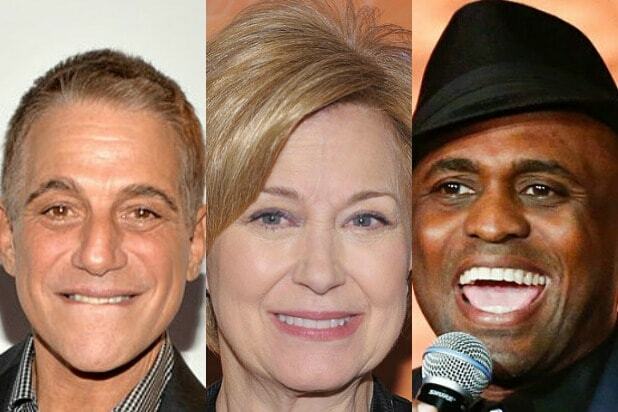 The irrepressible former "Taxi" star premiered "The Tony Danza Show" in 2004. Audiences were apparently unimpressed by games like "Extravadanza!" and the show was yanked after two years. "The Wayne Brady Show" arose out of his work on ABC's primetime improv hit "Whose Line Is It Anyway?" But Brady's charm evidently didn't translate to daytime, and the show was axed in 2004 after two seasons. "Anderson Live" had one of the most impressive sets in talk-show history, with big picture windows looking out on Central Park in New York. But viewers didn't care all that much for the view and CNN newsman Anderson Cooper saw his show axed after two seasons, ending in 2013. Queen Latifah is a real head-scratcher. The rapper and actress has broad audience appeal and likeability. But she's bombed with two different talk shows titled "The Queen Latifah Show," one in 1999-2001 and another from 2013 to 2015.